And of course, the Bible. And smaller it is indeed. The crib mattress fits right inside and it has little guard rails near the top. And in case those don’t do the job, it’s just a few inches to the ground which is padded with a pillow, safe in our bedroom. This got me thinking of the older children’s sleep milestones. The curious thing is they all reached sleeping on their own in very different ways. Rosie, our first, had her own room set up with a fun and bright jungle motif. We brought her home to the beautiful nursery that awaited her, and basically, used it as a place to change her diapers. All of the other time, she was in my arms, and subsequently in my bed. I of course told no one about this. No relatives and definitely not the other mommies in the baby group. I have to admit, not much got done those 6 months except a lot of loving, holding and nursing. At six months, scared, I took the advice of pop culture. All the experts in the parenting magazines said if you let children go past six months sleeping with you (if you had made that unfortunate mistake) there would be trouble to pay. The best option: let them cry it out. It will only last 2-3 nights and everyone will be better for it. So just like Baby Mabel on the sitcom Mad about You we let our dear one cry it out. With 20 minute crying sessions before dozing off she had “taught” herself to sleep through the night on her own. Rosie’s next sleep milestone came at 18 months when she graduated into a twin size bed with a guard rail on the side and a gate at the door. Her little sister was expected in two months and we would need the crib; there was no way I was going to make the mistake of bringing baby # 2 into bed with us this time. Well, little Galadriel came into the world and spent her first four days out of the womb, in the NICU, hooked up to oxygen. I spent those first 4 days with virtually NO sleep. I was firmly committed to breastfeeding Galadriel, something some of the NICU nurses weren’t supportive of, so every time she cried they called me down to nurse her. The schedule looked something like this: Nurse Galadriel for 45 minutes to 1 1/2 hours, burp and change diaper, walk back to room which was in a different wing of the hospital, crawl in bed and be called back in 15 minutes to nurse again and to start the routine over. To make matters worse there wasn’t even a soft chair to sit in. Not good for a postpartum mom! The nurse’s expanation was if I was going to nurse, than this is what is going to happen, because I wasn’t making enough milk to satisfy her. If I let her give Galadriel formula she’ll be content for hours at a time and I can get some rest. Ugh! I knew this wasn’t true but sadly, after a couple days, I relented and fed Galadriel formula through a little tube you hang around your neck. (Much to the nurse’s dismay I refused to give her a bottle.) Galadriel’s crying did not cease with the formula feedings nor did the feeding schedule. The doctors never gave Galadriel a diagnosis. Galadriel was still fussy as ever when we brought her home with an oxygen tank attached. This was particularly scary because during her crying spells her oxygen levels would drop and her lips would turn purple. After a full day in the hospital and a night of crying at home, I called the Pediatrician at 3 am, in tears, explaining that they had made a mistake in releasing Galadriel. The doctor reassured me that she was okay, and that maybe she was just a baby that needs the extra touch and comfort that only I could bring. She suggested I co-sleep with Galadriel and even let her sleep on my tummy while she nurses. Sage advice, but advice I wasn’t ready to take. For months I fought bringing Galadriel into bed with me. And for months she fought sleeping away from me. This vicious cycle, I believe, contributed to PPD and at around 4 months (if not before), I was giving Galadriel bottles of formula during the day for supplemental feedings & water at night in her crib so she would not need me. At six months, Galadriel was eating mostly solids and I weaned her completely. At two years, with a baby sister on the way, she graduated into a bottom bunk (with guardrails of course) while big sister at 4 graduated to the top! When Eowyn arrived, we once again had the nursery ready and waiting for her. She had a beautiful birth and was an eager nurser, a true pro from the beginning! She loved to nurse, and like her two older sisters nursed constantly. Unlike Galadriel, Eowyn didn’t like to sleep with me. I would try to cuddle up in bed for a nap with her and she would refuse to nurse. She didn’t like her crib but was very content in her car seat or a baby papoose seat. The only difficulty we had with Eowyn was that even though she was nursing constantly (every 2 hours for 45 minutes each feeding) she was not gaining weight like the doctors wanted her to. The nursing physically wore on me because I just wasn’t taking care of myself as I should. I wasn’t drinking or eating well. I wasn’t getting much sleep and it was so discouraging to nurse for so long to only have her spit it right back up. The medicine they gave her did not help because that would come right back up too. The one comfort I found while nursing Eowyn, was the awesome wonder I felt knowing I was giving myself as a gift to this precious baby just like Mary gave herself to Christ. Eowyn helped me to know the Blessed Mother and to image her during the time I was preparing to be received into the Church. What a beautiful gift she gave! Oh, nothing became of her lack of weight gain except a tall and slender girl, true to form! Eowyn graduated to a big, twin bed when she was two but not until after the birth of her brother because when he arrived rather than setting up nursery, we got out a sling we received as a gift with our first baby (but didn’t use) and opened our bed to him, whole heartedly! This time we didn’t take advice from magazines but rather we listened to the voices of experts like Madeline, Rosemary, & Dana, who had the credentials of mothering many children. Oh, and then there was Wendy and Lisa who were in the same boat as me and helped me learn how to use that sling that can be so intimidating! 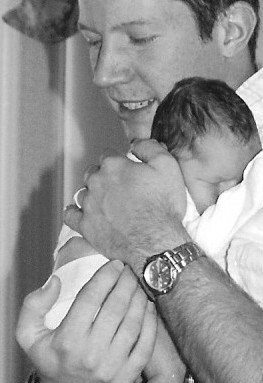 Once again I had the privilege of holding my baby all the time like I had with my first! We cuddled and nursed all day and night. And unlike Eowyn, Frodo had no problems gaining weight. (Once someone even commented that I must be serving him Haagen Dazs he was so chubby!) He and I slept great for 15 months cuddled together until the time came when neither my husband or I were getting much sleep. You see, there just wasn’t very much room anymore with three of us in that bed. We moved a mattress onto our bedroom floor, surrounded it with pillows and there Frodo slept waking twice in the night but comforted to sleep by our presence. Two weeks later we moved the twin mattress into a room with his sister, Eowyn, put it up on a frame with a guard rail and that is where he has slept ever since. Easy as that. No crying it out. Samwise was much the same as Frodo. He hung out in a sling nursing till his heart was content, riding in his Ergo on nature outings, and sleeping cuddled between my husband and I until tonight. Tonight he moved out of our bed because he has grown so big. And into a toddler bed because our house has grown too small for one more big bed so a new purchase was necessary. Just the other night a dear friend, blessed with the birth of her second daughter, asked if I could show her how to use the sling she was given. It was such a privilege to return the gift of “slinging” that my friends had given to me. Our life has been so richly blessed by attachment parenting, sharing our bed, being attentive to our baby’s need for comfort and, consequently, giving ourselves as gifts to our children. Should We Stay or Should We Go Now? Mary G. on I’m still alive!